The Specifications of Smart Glass - the next generation in glass privacy. The Smart Glass Company PA-LC Glass is used for any number of applications including privacy windows for the home and office, room partitions, room dividers, security panels, electronic curtains, door vision panels, conservatory roofs, window panels, advertising screens and much more. 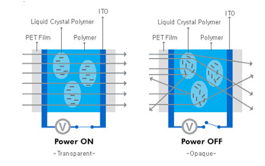 PA-LC (Polymer Assembled-Liquid Crystal) is a relatively new technology, which allows the transmitting or blocking of light, depending on the On - Off status of an electrical current. Our PA-LC technology will become the next generation glass technology in the global market. The PA-LC technology is the base material to make the light scattering product. The LCD Film has a controlling function of light transmittance. The light scattering function of this product is applicable to display images on the glass. This technology is based on the combination of a polymer with liquid crystal. The liquid crystal scatters the light in its normal status. However when an electric current is activated, the liquid crystals are changed to transparent. The diagram below shows the composition of The Smart Glass Company LCD laminate glass panels using an EVA interlayer. Our standard laminate glass is manufactured using two 4mm optically clear glass panels. The overall thickness is 9.5mm (plus cover trim), others thicknesses are available. Here the diagram demonstrates the protective plastic cover trim that is placed over one or all the laminate glass edges. The bus-bar edge must have the protective trim, but the other edges can remain clear if required. This diagram represents the installation procedure for The Smart Glass Company LCD laminate glass panels. Image one represents one glass panel with protective trims on all edges and images two and three show the trims only on the outer framed edges to allow the glass to remain clear across the surface area. Please note that we recommend that the electrical power cables come out of the top rather than the bottom if possible. Power cable can come out of the trim either from the centre or the sides. Finally, the diagram below represents the connection of The Smart Glass Company LCD laminate glass panels to the 110V transformer and switch unit. Please note that several panels can be activated from the same switch unit. Each LCD laminate glass panel has two 1mm power cables to be connected into the transformer. Several glass panels can be linked together through a junction box. Thicknesses of single toughened glass pane.